Live (above) and on our YouTube channel. Presidential hopeful Gemma O’Doherty discusses her campaign following yesterday’s address to Fingal County Council By Independent Councillor Jimmy Guerin, brother of murdered journalist Veronica Guerin. Posted in Misc and tagged Mid-Morning Presidential Matters. at 2:14 pm on September 11, 2018 by Bodger. How brave. A live YouTube video hosted by a sycophant. Why not defend your stance to the man himself yesterday? Bodger’s one blind spot is he loves a good aul conspiracy. We’re still waiting for this..
Also on that page “I would humbly suggest you do more research and stop relying on BBC/CNN/RTÉ/Irish Times to give you the complete picture.” which sounds delightfully Gemma-esque. She was bang on the money with the penalty points thing and did the state some service on that score but I’m beginning to think that it’s a case of a stopped clock being right twice a day now. Fair play Ivan, I like your tenacity. Obvs it’s no Ram (got a lovely Apple pressing on vinyl last week from discogs for tenner, track 1 is fupped but shur it’s only for looking at anyway) but I have to agree. I found meself humming along in bits. Saw the Grand central station gig. The voice is fupped and yet if he announced a gig here, I’d rain down blows on every fupper ahead of me in the virtual queue without it costing me a thought. anyone up for a bitta chat pitting? Have you finished the gin then Frilly? The gin-soaked housewife trope is as old as yourself Miggeldy. How do we get into the chat pit? Sadly, work doesn’t permit but for future reference. Thanks Frill, will give it a go one of these days. Any chance of Gemma being challenged on anything? Anything at all? Yes she did. At that meeting in Waterford. Problem is she is being challenged on it and can’t back it up. So she runs to Broadsheet where she knows she’ll get an easy ride. Broadsheet isn’t applying the same level of critical analysis to O’Doherty as it does elsewhere and it’s really, really disappointing. Can’t tell if this is satire or not. We need a font for satire too, then. b’s comment above on “Gemma, Your Campaign Seems To Have the Momentum of a Runaway Freight Train. Why Are You So Popular?” was bang on the money. Any comments on her own and her supporters carry on on the twitter and other spots at all? so gemma, can you do a tasty pentatonic lick in A minor for me please? No? Did she pre-supply the questions herself? No thanks, Gemma. No thanks. I really wanted to like her based on her penalty points work, and shining a light on obvious Garda corruption that is obvious…but….she has totally changed my mind in the last couple of weeks…you cant just spout something like “the state killed veronica guerin” and then not at least attempt to back it up, i mean does she mean the Gardai turned a blind eye cause someone paid them off? does she mean a Garda rode up on the bike and pulled the trigger? utter nonsense. Charger is her campaign manager. Add to that the “I’m not anti-vax, BUT….” rhetoric. Big pharma, elites, mainstream media, etc, etc. Well done Gemma. A very brave woman and one we need today in Ireland. Unlike the presstitutes that cover the news for msm that nobody gives a toss about or that twist the facts on this woman stands out for her ability to stick to the facts. What “facts” is she sticking to? I just dont get it, why do you hate her so much ? Why not just let her do her thing, by all means tell you mate how you feel..
You well know if she gets the nomination , you don’t have to vote for her. It seems you want to make sure nobody votes for her, that’s a bit strange, if the Presidency has no power what is there to worry about ? What am I missing ? It’s not “hate”. Ms O’Doherty disguises her antichoice, antivaxx and antitrans traits as “just asking questions”. And when anyone is “just asking questions” of Ms O’Doherty, she threatens them with legal action. You are becoming hilarious Daisy, please keep this up. Ok I understand, I wont argue, you could be bang on the money , but when those rumors started , I was astonished myself, I then took the effort to read the articles she wrote in that area, and I didn’t find anything to be worried about. That’s being misreported , I will grant you I haven not heard any statements she made about those issues in private. To my mind, her situation reminds me of (now you are going to start howling) McCabe , lots of dirty rumors flying around and statements being misrepresented. The bitterness towards her from my experience of living in this country would make me very dubious about whats being claimed about her. Someone want to give me a TLDW? You comment every time she appears on bs, this will not change..
No reference to anything other the evils of RTE and the rest of the MSM, sounded liked a chat in the International Bar on a Tuesday afternnon by two failing journos struggling to get paid work. What about any talk of her views on social change in Ireland? Gay marriage? Abortion rights? All this talk of corruption in Ireland and no reference to the church? Basically, I wish her well in uncovering corrupt practices and collusion between the media and the state to cover up but where is the Presidency is not the position to push this. With respect she doesn’t seem very Presidential. She’s fit for this role. He’d have to call on poetry. A few lines of Blackberry-Picking maybe. Intoned with huge solemnity. Then “drop mic” move. Totally agree with her on Tullamore,I think she’s remarkably brave and courageous and wish her all the best in getting nominated. If you think she’s a ‘whack’ job/nut case clearly you didn’t follow now Secretary Ben Carson’s campaign, who compared abortion to human sacrifice ! Why do people care so much about her views on issues that have been settled/resolved like gay marriage,abortion,I’d like hear her views on a border poll,Brexit,yank vulture funds,completly unreliable crime stats, homeless,legalising weed, etc. Why waste your time listening to her views on issues such as crime and homelessness. If she had the remotest intention of tackling any of these, she would not be seeking to hide out in splendour at the Aras for seven years. She would be running for an office that would give her some actual power to bring about change. “Rossa Fanning, for ACC, told Mr Justice Peter Kelly yesterday that an agreement had been reached between the sides earlier that morning. Under that agreement, the judge entered judgment in the sum of €2,519,017 against the defendants. What bearing have Jimmy Geurin’s financial difficulties have on either Gemma O’D running for president, or her 100% unsupported theory that there was Garda collusion in her murder? That just seems like a cheap-shot on your part, Johnny. Great interview my a###. another easy ride from BS, who are not main stream media and therefore should be asking the difficult questions. And journos should be with the ordinary people not the elites – says she who wants to President. Imagine a national broadcaster who smears a presidential candidate and then does not give them a right of reply. Imagine if your taxes and licence fee paid for that corrupt censorship. Welcome to Ireland aka #Ignoreland 2018 where this actually exists. RTE is the propaganda tool of a corrupt state and you’re paying for it. It’s not that long a go where RTE allowed the clergy to run amuck up and and down the corridors and studios of Montrose without asking them one question about child abuse. They have no credibility as far as i’m concerned. Just because you;re an economic hostage doesn’t mean you have to be apathetic to whats going on. Now imagine if you were an investigative journalist getting paid by nobody to work tirelessly and relentlessly to get justice for murdered Irish citizens you have no personal association with. You’re doing your job to highlight inconsistencies and corruption as we would want a credible investigative journalist to do IN THE PUBLIC INTEREST. If the Gardai are not keeping murderers off our streets I for one am glad that Gemma O’Doherty is trying her best to do that job while at the same time seeking justice for our citizens who have been murdered. It’s beyond families emotions i’m afraid. Sorry if that sounds insincere and callus. 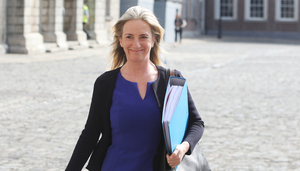 The facts are that no one has been satisfactorily convicted of any of the many murder cases Gemma O’Doherty has and continues to investigate. Now please think if you were to be murdered or anyone close to you was to be murdered, would you want some one like Gemma O’Doherty asking question on you or your loved ones behalf? You’re worse than a trump supporter. No one is stopping her from running. Noone is smearing her. No one is denying her a right to reply. Thought you were done commenting on her rotide.. I thought I’d been clear on this Jusayin, It’s flattering and I’d be lying if I said I wasn’t curious, but it’s just not gonna happen. The spark just isn’t there. You and a lot of others on BS seem to be particulary excercised by O’Doherty.I don’t know a lot about her,but she seems to have done some good work re the gardai.Asking about corruption and other serious issues seems to me to be a good thing,but then I don’t live in Ireland and I don’t know the whole story. All the reasons you listed are reasons for Gemma NOT to be president. Because she can’t continue to do those things as President. in your pro corruption opinion Rob.. Right of reply, you say? What was Paschal Sheehy offering her so? All she had was “I’m saying nuthin'”. Who’s going to invite dead air on their show. Surprisingly good interview, well done! Not hard-hitting or anything, but raised some interesting points. I’m not writing her off yet. In fairness to Jimmy Guerin, nowhere in the story does he say he found 10 million in his shed. That could have been the sub running away with him/herself with the headline. Evenso. Actually, I read that too quickly. He says exactly that. In other news… wouldn’t you think Peter Casey would have offered Gemma a lift in the copter. I see some people on here are keeping alive the idea that Irish people are naturally predisposed to resentment. You would swear some people went to secondary school with Gemma O’Doherty and didn’t get along, the way they carry on.